Finlay Stewart hasn't been able to forget the scarred dragonwoman he met at Stonefire six months ago. When the same female agrees to be fostered with his clan, Finn pursues her. Balancing his clan duties with his need to see Arabella isn't easy, especially with the existing rift in the clan, but he's determined to try. Arabella's inner strength draws him like no other female before. 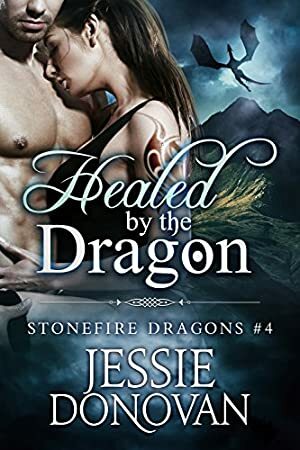 Note: This book was previously titled, "Healed by the Dragon: Boxed Set (Parts #1-4)." However, it is exactly the same story. Log In to track Jessie Donovan on eReaderIQ. to be notified each time the price drops on any book by Jessie Donovan. to stop tracking Jessie Donovan. Log In to track Hot Tree Editing on eReaderIQ. to be notified each time the price drops on any book by Hot Tree Editing. to stop tracking Hot Tree Editing. We started tracking this book on May 2, 2015. The price of this book has changed 2 times in the past 1,449 days. The current price of this book is $4.99 last checked 11 minutes ago. The highest price to date was $4.99 last reached on February 23, 2019. We last verified the price of this book about 11 minutes ago. At that time, the price was $4.99. This price is subject to change. The price displayed on the Amazon.com website at the time of purchase is the price you will pay for this book. Please confirm the price before making any purchases.